If you are looking forward to ushering in the New Year in the hub of nature, surrounded by beautiful sceneries in a warm and comfortable climate with plenty of beaches and activities to keep you occupied, Honolulu, Hawaii is a place that would prove to be the perfect option for you. Hawaii is located in Oceania and remains the only state to be made entirely of islands. The capital of the state is Honolulu, and is located on the island of Oahu. The state enjoys immense popularity among the tourists. It has a lot of natural beauties and attractions to offer, so you can be confident that the New Year’s Eve you spend in Honolulu would be among the most memorable moments of your life. As mentioned before, Honolulu enjoys quite a bit of popularity among tourists, which is why it sees a lot of traffic during New Year’s. Therefore, you will need to make your booking well in advance to be able to find a plane ticket at a decent price. During New Year’s, various packages and deals are offered by the travel companies, but on average, a cost of around $500 is what you would be required to pay to travel to Honolulu. Your departure place would also influence this amount. There is plenty to keep you occupied during New Year’s in Honolulu. 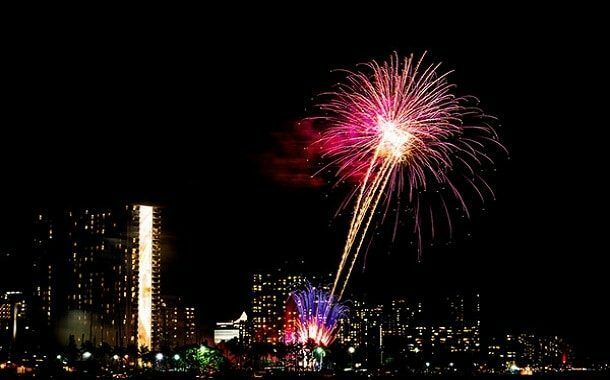 You will get to see an impressive display of fireworks at the Waikiki Beach, which starts at 11:55 pm. This show does not require any ticket, so you can watch the entire display from the beach completely free of cost. A New Year’s Eve party is held at the Aloha Tower Marketplace, which is a hub of entertainment, food and much more. This would cost you around $45 per person. Another party is hosted by the Kahala Hotel and Resort with prices that start from $123 and end at $184, depending on whether you are a guest at the hotel or not. The party would have a buffet, dancing, fireworks and a lot more. A masquerade ball is organized at Tiki’s Grill at the Aston Waikiki Beach Hotel that includes entertainment from live bands, DJs, and fireworks. Entry to the party is free of cost. Multiple other parties are hosted at various locations, with a cost that lies in the range of $80 to $250. During New Year’s, due to the special offers introduced by restaurants, the price of meals is reduced to a great extent. Places like Tiki’s, Beachhouse at the Moana Surfrider, and similar other places offer rather enticing deals. Therefore, during this time, a meal would cost you around $40 to $80. The type of transportation you use depends on the duration of your trip. If you are in Honolulu for only a couple of days to enjoy New Year’s Eve, you can use the bus system and do not need to rent a car. Traffic in the city can get a bit tough to handle, so driving is something that you should try to avoid. You can also opt for a taxi, which would cost you around $40 to $50. If you decide to rent a car during your trip, it would cost you around $35 to $40 per day. Tourism in Honolulu is high throughout the year, but it is at its peak during New Year and Christmas. As a result, the cost of accommodation tends to increase in the area during this time. Various options are available, such as the Pagoda Hotel which costs around $105 per night, the Kahala Hotel and Resort that charges $520 for a single night, and Pacific Beach Hotel that charges $159 per night. If you are not interested in New Year’s Eve parties, there are other activities that you can enjoy. You can get individual surfing lessons for $100, while group lessons would cost you $75, so you can do it with your family or friends too. You can also visit museums such as the Pacific Aviation Museum or the Bishop Museum with an entry that would cost you around $25. Should the average working Joe book a New Year’s Vacation in Honolulu? If you have the necessary funds, then visiting any part of Hawaii for New Year’s Eve Celebration will be an experience you will never forget. Book travel tickets and accommodation well in advance, to be sure that you’ll spend the least on them and have more money to spend on you and your loved ones during the trip. Also be on the lookout for discounts for this particular time of the year because you might get discounts of 50% or more. How Much Does an Average Christmas Present Cost? How Much Does Dog Spay or Neuter Cost?